This is a shop front being glazed in Tiptree Essex. 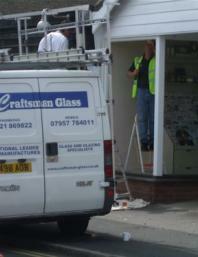 We can re-glaze any size shop front glass, this one was small,with only two men working on it . We recently did one that needed six men to lift the glass into place. All our glazing work meets the safety regulations and shop fronts are Laminated Safety Glass of different thickness depending on the size of the opening. 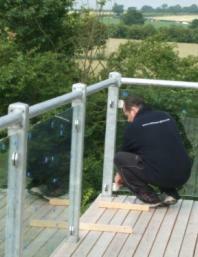 Far right image Here is Scott fitting 12mm Toughened Safety Glass to a balcony in Latchington Essex. This glass was over 2.5 meters long and we had to carry seven of them up two flights of stairs. The glass is griped between clamps to hold it in place. Craftsman Glass Ltd. Supply and Fit all types of safety glass.